Using the .NET Gadgeteer platform with XBee radios got a lot easier with the alpha release of XBeeClient libraries written by Paul Mineau. XBee radios use low-bandwidth serial protocol that is useful in many applications. This example implements an XBee network using three XBee radios that support a surveillance device. 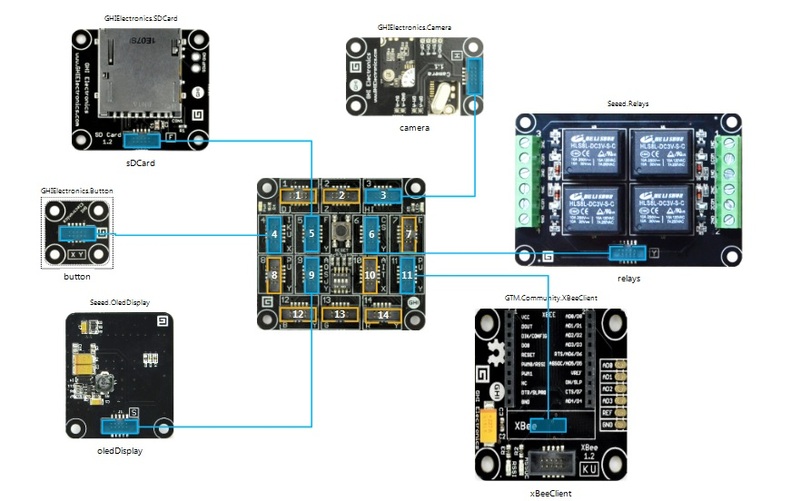 The .NET Gadgeteer modules include a Gyro module and Relay module from Seeed Studio, and a Camera module and SD Card module from GHI Electronics. The XBeeClient libraries are designed to make set-up and testing of XBee radios easy. Download the Alpha 1.0.0.0 version of the libraries from CodePlex, and run the .msi installation package. If you haven’t yet used the X-CTU tool from Digi to flash your radios, see XBee Radios in .NET Gadgeteer Devices. The process is not entirely painless, but we’re just getting started with these things. In this example we’ll set up two XBee API router devices using .NET Gadgeteer XBee adapters from GHI Electronics. We’ll run the XBee coordinator on an Explorer dongle. The InteractiveConsole PC application that is included with the XBeeClient libraries is great for testing, and in scenarios such as this, it is fine to use it as the PC component of a network of XBees. 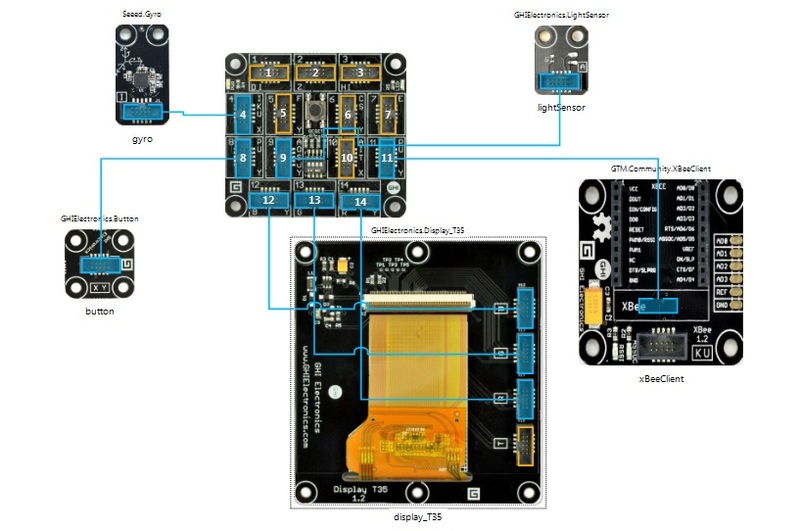 The device that sends the security alert when a door opens uses a GHI Electronics Spider mainboard, an XBee radio in an adapter from GHI Electronics, and a Gyro module from Seeed Studio. The following illustration also shows a button, GHI Electronics Light Sensor module, and Display_T35. These last two modules are not essential for operation of the device, but the Display_T35 is very useful in calibration of the gyro; you’ll have to orient the axes of the gyro and set a threshold that triggers an alert when the door on which it is mounted opens. The Light Sensor provides useful feedback by measuring brightness when the other device in the network turns on the lights. Dragging the GTM.Community.XBeeClient library from the toolbox adds the image of the GHI Electronics XBee adapter to the Designer surface (click to enlarge). The core of this application is a little bit of code that monitors the Y axis of the gyro and sends an alert when the threshold is reached. In this example rotation that is at least negative 50 indicates the door has been opened. The XbeeClient object uploads the string door-open, which sends an alert to the two other XBee radios running on the same PAN ID. One of the other XBees is the coordinator on the PC dongle and the other is running on a device with a relay that turns on lights and a camera to take pictures. // The following display code is not used after calibration of gyro. Another interesting bit of code is that which gets the Light Sensor measurement. This is an analog sensor. You can use actual voltage from the Light Sensor or a percentage figure. We use voltage as shown in the following code block. The display code, as in the previous code, is extraneous to the working application. When a timer ticks, this code measures the light in the area under surveillance. If the light produces greater than 2.9 volts in the sensor, the XBeeClient object uploads the string light-on-xbee1. If the light is insufficient for taking pictures, the XBeeClient uploads the low-light message. The complete Program.cs file of the XBeeClient_1 is shown in the following code block. The second .NET Gadgeteer device in this network of XBee radios includes a relay that turns on the lights and a camera that takes pictures of the area under surveillance. An SD Card module stores images taken by the camera. Again there is a display module that is unnecessary for the working application but useful in setting it up. The following illustration shows the designer surface with the modules used in this device (click to enlarge). The core of the application is the following code that starts a timer when the door-open signal is received from the gyro in the previous device. This code sets relay number 4 to true, closing the circuit that turns on the lights. The timer starts and runs until a low-light message is received from the other device or until the user pushes a button to stop it. You can also stop it by sending the low-light message from the InteractiveConsole, which is described under the final heading of this article. Each time the timer ticks, the camera takes a picture and stores it on the SD Card, as shown in the following code. The previous devices use XBee radios configured as routers. The final element of this scenario is the XBeeClient InteractiveConsole, which uses an XBee configured as the coordinator. The InteractiveConsole is a PC console application. It integrates testing and control mechanisms that are invaluable in setting up XBee networks and useful in many complete application scenarios. If you don’t need everything in the XBeeClient InteractiveConsole, you can re-use any of the code as needed. All the source code is available on the CodePlex site. The InteractiveConsole is about 100 lines of code, as shown following. Running the coordinator on an Explorer dongle, you can extenisviely test the network that includes the previous devices and send the door-open or low-light strings to start and stop the lights and camera. All messages from the other radios are received by the InteractiveConsole and displayed in the command window. This brief overview shows the potential of the XBeeClient libraries and introduces a few of the features of this alpha implementation. Try it out for yourself. There is lots more to be done. This entry was posted on May 25, 2012, 11:00 PM and is filed under Embedded Microcontrollers. You can follow any responses to this entry through RSS 2.0. You can leave a response, or trackback from your own site. Looks like that’s it. The library hasn’t been updated. The source code is there, which might help you figure out how to use the serial interface. As I recall, the problem is with the readline and writeline functions. You can parse the raw byte stream if you have the chops. XBee radios were discussed quite a lot on the GHI Electronics forum, and there was a community development effort. I had to punt after these couple of experiments. I’m working on updating the XBee Client to 4.2, should have this fixed today. I just updated to work with 4.2, and added a hydra sample project. I didn’t test with Spider or Cerberus yet though.